E. Dake Plumbing & Heating is proud to serve the Painesville community! About Painesville, OH - Happy to be your hometown Heating & Air Conditioning Contractor! The city of Painesville, Ohio was first settled at the turn of the 19th century. A group of pioneers led by General Edward Paine built a small settlement as part of the Western Reserve. Later, several small townships joined together to form what is today Lake County. 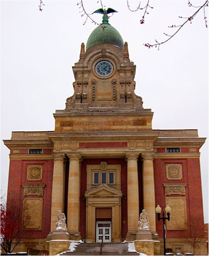 Painesville has served as the seat of Lake County since 1840 and was officially chartered as a city in 1902. Painesville is located near the southern shores of Lake Erie, 30 miles east of Cleveland, and along the banks of the Grand River. Extremely moderate temperatures that remain fair throughout the majority of the year make this appealing location even more pleasing. Residents spend time taking in the beautiful weather by hiking or rafting along the river, driving down to the lake shores, and getting in an occasional around of golf at either Quail Hollow Resort or Little Mountain Country Club. For those looking to feed a specific interest, Painesville has a wide variety of activities that allow couples, families, or groups of friends spend quality time together. The Indian Museum of Lake County is filled with information about the indigenous people that lived in Ohio before its settlement. They maintain archaeological sites, exhibits, and events, which are popular with students, tourists, and anyone looking to stay in touch with the history of the Lake County area. Other activities unique to Painesville include watching races at Lake County Speedway, the only NASCAR track in northeast Ohio, or shopping for treasures at the Craft and Antique Co-op, a collection of small shops that make up the largest store in the state.